The best part is that there is NO color shift at all! This is NOT black. I have read where people are disappointed that this is not a black metallic. It’s not meant to be black, nor does it claim to be black. This is graphite, think pencil lead. Add equal parts of Premo! 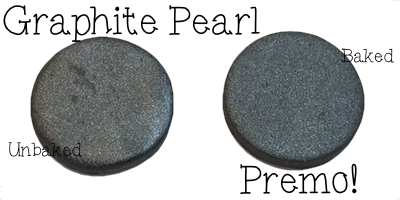 black & graphite pearl to make your own black metallic. This looks gorgeous paired with peacock pearl & blush.